American firm In Situ Studio has completed a compact, L-shaped family dwelling that makes the most of a challenging suburban site. 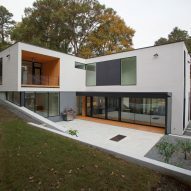 The Medlin Residence is situated on a suburban property in Raleigh, the capital of North Carolina. 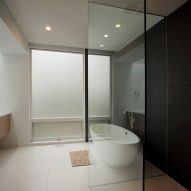 The clients requested a four-bedroom home with generous public spaces and a connection to the outdoors. 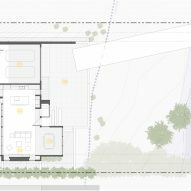 The relatively narrow, linear lot had several constraints. The north end slopes down toward a street and is traversed by a stream, making the area a floodplain. Due to these conditions, no construction could occur in the front half of the property. Opportunities were also limited in the back portion, which has an extreme slope at the south end. "Our response to these constraints was a compact, two-storey 'L' that creates a private outdoor space between the house and the hillside," said local firm In Situ Studio. Concrete was used for the home's foundation and retaining walls, while wood was used for the framing. Steel was deployed in a handful of areas to achieve large spans. Facades are wrapped in white stucco, dark metal and warm-coloured wood and are punctuated with various sized windows. "Windows are a mix of storefront and aluminium-clad wood residential frames, with storefront utilised to achieve odd geometries and larger openings," the architects said. For the street-facing elevation, the team created visual interest by incorporating a slanted, glazed element that contains a staircase. The stairs lead to a boxy volume that slightly cantilevers over the driveway below. 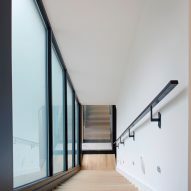 Programmatically, the stairs connect two public zones within the 3,743-square-foot (348-square-metre) house. "Because of the tight available construction footprint, not all public spaces our clients wanted were able to fit on the ground level," said the architects. 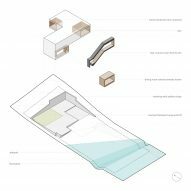 "Therefore, we located an informal den space on the upper level and connected it to public spaces downstairs via a stair that dominates the expression of the front elevation." 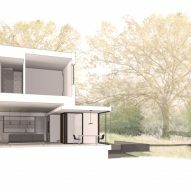 The lower level of the house contains an open-plan kitchen, living room and dining area, which connect to a patio. The master suite and children's bedrooms are placed upstairs. The interior features flush doors, "pickled" white oak floors and cabinets sheathed in thermofoil – a special type of vinyl. The colour palette was largely limited to white, grey and black, along with various wood tones. Despite its ample glazing, the home is afforded a level of privacy due to the site's topography and landscaping elements. 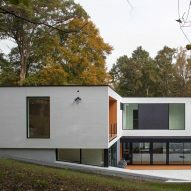 "Much of the existing vegetation on sight was maintained, especially along the stream edge, which provides a veil of privacy between the house and the road," the team said. 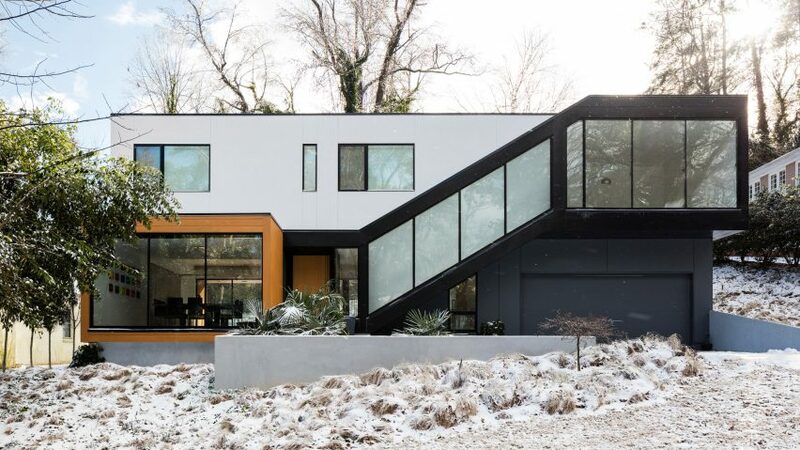 In Situ Studio has worked extensively in its home state, with other projects including a rectilinear home in the Charlotte area that pairs dark cladding with white stucco and the revival of a midcentury modern dwelling in Raleigh that had been "haphazardly chopped up" over the years. Photography is by Keith Isaacs unless stated otherwise.